Lowell’s public library was founded on May 20, 1844 by an enactment of the Lowell City Council. At the time, the idea of “free” public libraries supported by solely by municipalities was a relatively new one, but the leaders of Lowell clearly believed in the idea of investing in the betterment of its citizens. The library, originally named the “Lowell School Library” opened its doors for the first time on February 11, 1845 in the Old City Hall building at the corner of Merrimack and Shattuck Streets. The holdings of this library constituted approximately 3,500 volumes and there was a fifty cents annual fee for use. In 1860, the library’s name was changed to “City Library of Lowell” and in 1873, having outgrown its space, the library was moved a short ways down Merrimack Street to the Masonic Temple in the historic Hosford Building. The library was made free in 1883 and in 1888 a board of trustees was appointed for the first time. In 1889, the Lowell City Council passed a resolution providing for the erection of a new City Hall. Shortly thereafter, as a result of a petition by Lowell citizens, the Council authorized a second building to be located adjacent to this new City Hall, to be dedicated to the memory of the Lowell men who had lost their lives in the Civil War. This building would also be the site of the new library. 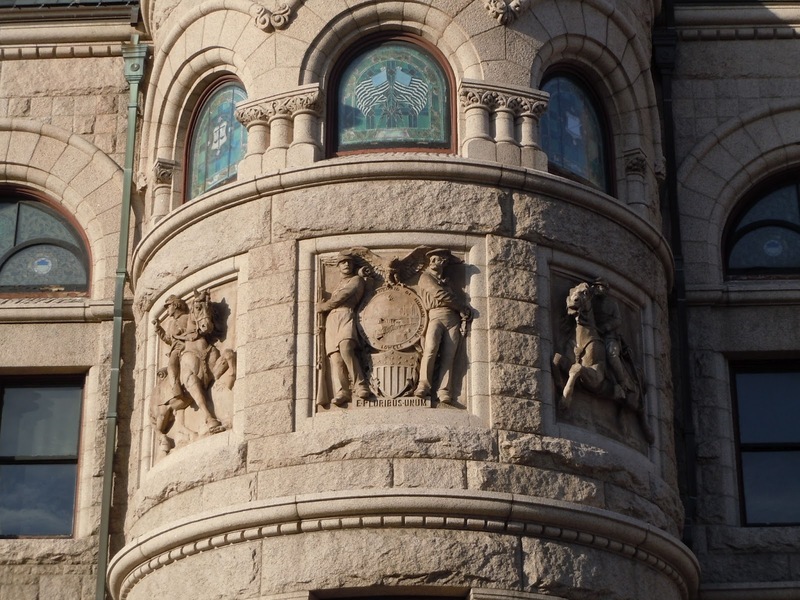 The city hired Lowell-born architect Frederick W. Stickney to design Memorial Hall. 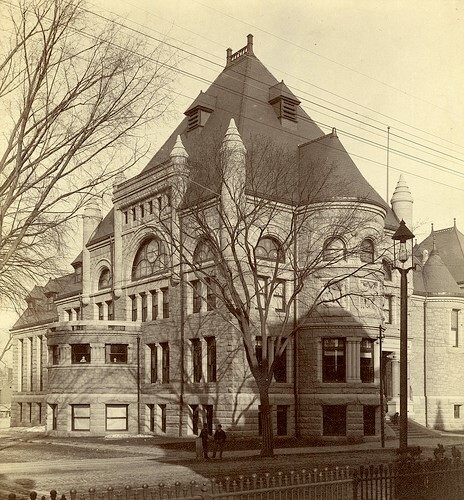 During the ceremony to lay the cornerstone, Edward T. Russell, Commander of the B.F. Butler Post of the G.A.R., said the new building would be “a monument to the heroism of the past and a storehouse of knowledge for the future.” Memorial Hall opened in 1893 with the City Library in its basement. A disastrous fire in 1915 left Memorial Hall a blackened ruin. The city began to rebuild immediately. Frederick W. Stickney, was hired back to plan the reconstruction. The budget of $62,927 for the entire building did not permit the restoration of the elaborate coved ceiling, carved oak wainscoting, and massive chandelier of the original hall. Instead a more modest, and modern, design was chosen. The eight original leaded glass commemorative windows were reproduced, at a cost of $1,475. But instead of carved wood, the walls were stenciled and huge murals were installed. Marble and bronze memorial plaques were restored, adding the names of those Lowell men sacrificed in the Spanish-American War. The city purchased the three massive murals, now hanging in the second floor reference room, painted by the French-born artist Paul Phillipoteaux. Two of the paintings depict early victories for General U.S. Grant (The Battle of Shiloh and The Battle of Fort Donelson) and a third painting showing Lee’s Surrender at Appomattox. Phillipoteaux is best known for his painting of the Cyclorama of Gettysburg, now permanently housed at the Gettysburg National Battlefield. The canvases were painted for traveling carnival display and were purchased by the City of Lowell for a mere $1,500 from the Griffin Amusement Company. With the passing of the Civil War generation, Memorial Hall was closed to the public and eventually became the home of the Lowell school department’s curriculum office and printing plant. Other than that, nothing had really changed at the library since it first opened in 1893 so by the 1970s, repairs and updates to electrical, heating and plumbing services were desperately needed. In 1970, Plexiglas was added to the outside of the existing stained glass windows for stability and protection and in 1972, the exterior of the building was sandblasted and the roof was repaired. In 1974, the city dedicated $1 million from its Capital Improvement Program for the “rehabilitation of the library.” This money was used to upgrade the heating and dehumidifying systems and to install an elevator. In 1981, the City Council voted to rename the Lowell City Library, the Pollard Memorial Library in honor of long-time city councilor and former mayor Samuel S. Pollard. In the early 1990s, the future of the library was in doubt. Major repairs and upgrades were needed and some questioned whether the nineteenth century building was suitable for twenty-first century use. After much study and debate, the city of Lowell allocated $10 million for major renovations. The entire contents of the library were moved to rented space on Middle Street where it operated for the twenty-eight months of construction. A combination of selective demolition and imaginative reuse transformed the library. Highlights of this 2002 renovation include the addition of a mezzanine level for more book storage, the creation of a ground floor handicap accessible entrance and a community room with a 75 person capacity also on the basement level. In fact, the entire ground floor was transformed from a basement-like feel to a comfortable, well appointed children’s space. Memorial Hall, which had suffered from peeling paint and water leaks, was completely redone and became the new reference area. In January 2018 the library suffered damage from a massive water leak in the heating system above Memorial Hall. The library was closed to the public for two months to complete recovery efforts.